Bouwas Mawara and his wife Nyengeterai, small scale farmers in the semi-arid Zvishavane district of Zimbabwe, are renowned for their innovation in water harvesting for crop and animal production, and for setting up local structures and systems to spread innovations amongst fellow farmers. Today at least 160 farming families in their community are more resilient in the face of droughts, dry spells and the long dry season. Bouwas Mawara received little formal education and was formally employed for six years before returning to his home in Mazvihwa communal area to become a full time farmer in 1976. His wife, Nyengeterai, completed primary education and worked as a shopkeeper before also becoming a full time farmer. Mazvihwa lies in a hot, semi-arid region that receives 450-650 mm rainfall annually. 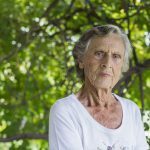 They farm summer and winter crops and a range of fruit trees on four hectares. Their livestock graze on the communally owned pastures. In 1976 Bouwas’ major focus was low-risk horticultural production, which depended on manual watering. But the 1976 drought caused the well to run dry before the beginning of the next rains. Bouwas’ initial solution, to dig a bigger well, proved fruitless. He realised that the real challenge was not how to harness the little groundwater that remained, but how to increase its volume. The breakthrough occurred between 1976 and 1980 when he experimented with the idea of using a dead level contour above the well to recharge it. Dead level contours are different from the contour ridges that were promoted by the government that drained water away. A dead level contour is a channel dug into the field with a zero gradient. Water is stored in the channel and then slowly infiltrates the soil. Bouwas used a spirit level to mark the contour. His contour trapped and retained water and the spring was effectively recharged. 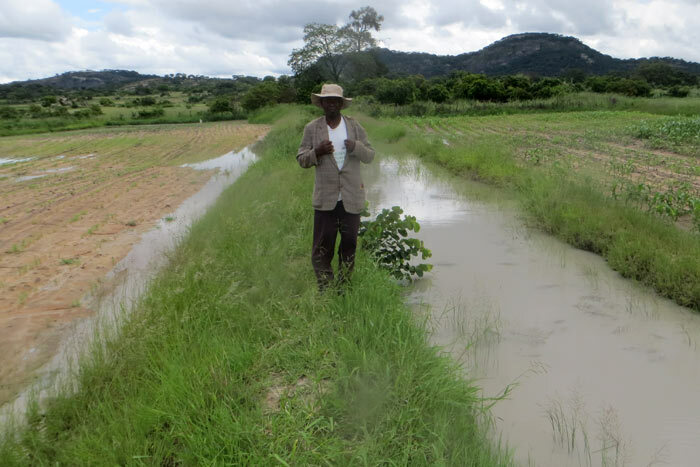 This motivated his family to convert the other contours on their land into dead level contours to increase groundwater recharge and make more moisture available to crops on the farm during the rainy season. By 1986, most of their contours had been leveled. Today they have nine dead level contours ranging in length from 85-320 m with an average width and depth of two by two metres. Bouwas’ philosophy is “water means to the soil’s life what blood means to a person’s life.” The family has integrated the water harvesting with their production system to create a healthy and productive farm. Water harvesting has enabled them to be food and nutrition secure since the early eighties, which is quite a feat in Zvishavane. Even in 1992, during Zimbabwe’s worst drought in living memory, Bouwas’ family produced surplus food. Income from agricultural production has enabled them to buy 70 head of cattle, build a decent house and educate their children. Nyengeterai likes growing groundnuts and finger millet, whose sale and income are under her control. She has used some of her income to buy chickens, goats and cattle. Bouwas introduced relay cropping, which allows them to farm across seasons and harvest two or three times per year from the same plot. He grows fodder for his livestock and ensures that his soil has adequate manure, which he gets from his livestock and organic material from the farm. 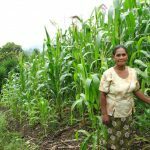 Their average maize production is five tonnes per hectare, when most smallholders in similar areas get less than one tonne per hectare. By 1986 the family had so much water in the contours that Bouwas introduced three kinds of fish, bream (Tilapia sp. ), catfish (Clarius sp.) and masinde (Barbus sp.). He says, “we used to have fish in the well and we built on this idea.” It is a major source of income and nutrition for the family. It is less labour intensive than cropping and has a good local market. Neighbours also benefit through access to water on Bouwas and Nyengeterai’s farm during drought years. And, some of the water they harvest flows into the local stream and recharges the groundwater. Bouwas has learnt from government agricultural extension officers, from ENDA-Zimbabwe and from fellow farmers. He travelled in Zimbabwe to Bukwa in the eastern districts of Chimanimani to learn about local farming practices, and got inspired to grow fruit trees effectively. On a visit to the Land Care Programme in Australia in 2000 he learnt about soil erosion control using bana grass (Pennisetum purpureum). He works tirelessly to share the knowledge he has gained with his community and is an important player in what is now a key strategy for family farmers’ resilience in Mazvihwa. He worked with Zephaniah Phiri, another innovative farmer well known as ‘the Water Harvester’, to set up the Hupenyu Ivhu (Life is Soil) Farmer Innovators’ Group in 1989. They received transport, networking and communication support from the Zvishavane Water Project. Currently, Muonde, a community based organisation, provides a platform through which dead level contours are scaled out. “Muonde also organises workshops and field demonstrations for farmers on using A-frames to peg dead level contours,” says Abraham Mawere, director of Muonde. At its peak Hupenyu Ivhu had about 550 members in three districts – Zvishavane, Chivi and Mberengwa. The members learnt about and practised water harvesting and how to use the water to increase agricultural productivity. The group is still functional in Zvishavane, where the current membership stands at 160. The reduction in membership can be explained by the economic difficulties from 2000 to 2008 which made it hard for farmers to save money for group activities and this was worsened by the shrinking budget of the Zvishavane Water Project. Hupenyu Ivhu was more resilient in Zvishavane because “it has a longer history, is deep rooted and had a higher concentration of leadership. However, it has also produced outstanding innovators in the other districts,” says Bouwas. The current members are organised into groups of about 20 each. They organise meetings and host look and learn visits to spread and adapt the innovation to different ecological environments. Further scaling out of the innovation is challenged by a lack of resources, equipment and capacity to compile training materials. There are plans to link the groups and revise ward and district structures and form regional structures that facilitate the spread and strengthening of innovative, sustainable and productive farming. However, they experience transport and communication challenges as the distances between farmers are large. To overcome some of these challenges the local strategy is for the members of Hupenyu Ivhu to use their farms as demonstration sites. A related strategy is to strengthen each local group through joint production for the market and to organise production training meetings with government extension workers. 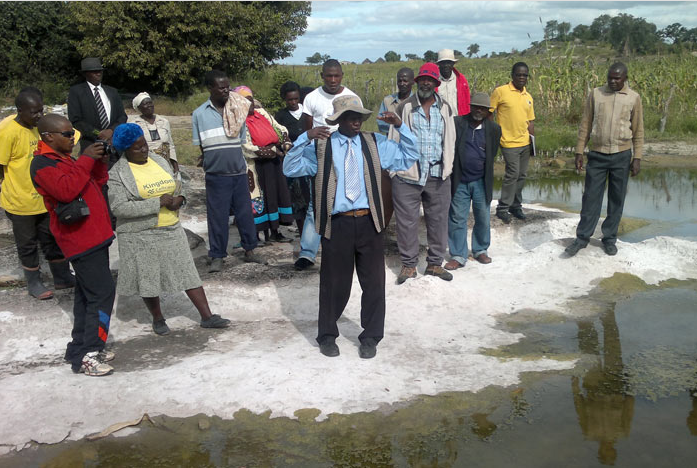 Bouwas won the 2014 Phiri Award for Farm and Food Innovators and he has been elected as an executive member of the Zimbabwe Small Scale Organic Farmers’ Forum (ZIMSOFF). This formal recognition makes his work more visible, accessible and appreciated and this prominence in turn supports collective innovation and promotion involving researchers, academics, policy makers and funding partners. 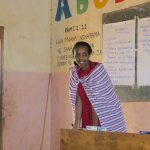 In July this year, Bouwas led a team of eight farmers to teach water harvesting at Mlezi Agricultural Training College. Such occasions, though rare, are gaining ground in recognition of the relevance of traditional wisdom, local knowledge and innovation. Mutizwa Mukute is a research and development consultant and Rhodes University Research Associate with over 25 years experience of working in the agriculture and natural resources management sector. It is with great sadness to share with you that Mr Zephaniah Phiri passed away on 1 September, 2015. 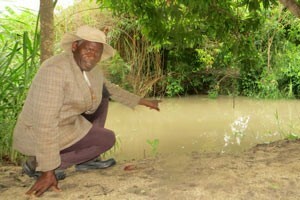 He was known as the ‘Water Harvester’ and an influential ecological farmer in Zimbabwe and beyond. A fraction of his important and innovative work is documented on these pages. Read a full obituary.